Adrianna Costa believed she and boyfriend Scott Gorelick had traveled to a nearby hotel for a work-related event. She had received an invitation in the mail a few weeks prior, and since the date coincided with their one-year anniversary, they had decided to turn it into a weekend vacation. 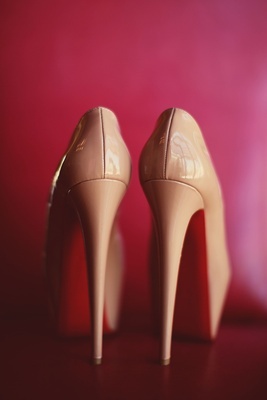 However, when she arrived to the suite for the first scheduled affair, instead of business colleagues, she found musicians and a photographer. Then, out of nowhere, Scott appeared on bended knee, engagement ring in hand, and Adrianna quickly realized the entire convention had been a façade. “It was one of the most memorable nights of my life,” she smiles. 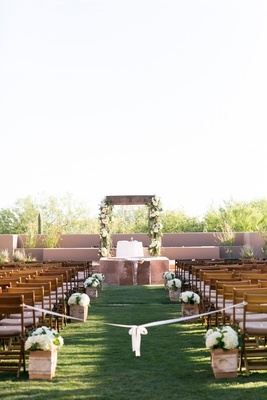 The couple’s springtime nuptials took place on the lawn of a luxury resort in Arizona, the enchanting arid landscape serving as a breathtaking backdrop. 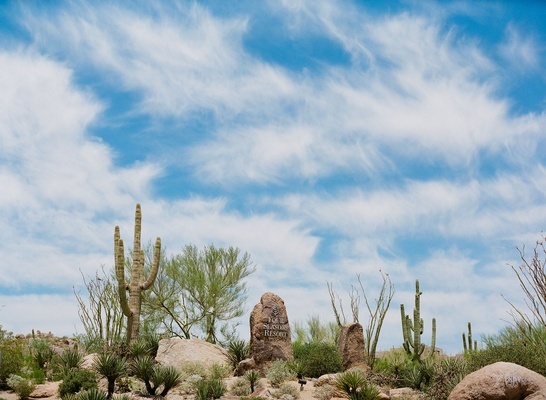 “There is no place more magical than the Sonoran Desert,” explains the bride. 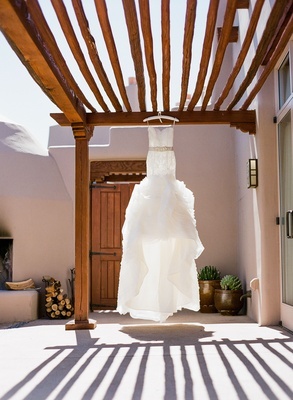 Décor was kept understated so as not to overshadow the scenery and to blend flawlessly with the pueblo-style architecture of the hotel. 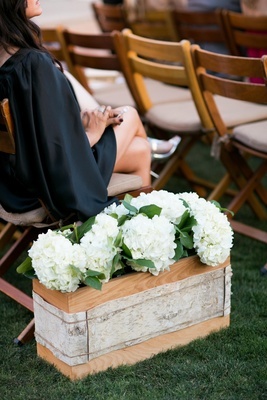 Wooden chairs and low timber boxes containing delicate arrangements of ivory flowers rested on either side of the ceremony aisle. 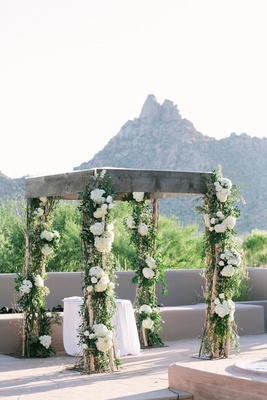 The chuppah was constructed from exposed branches intertwined with additional vanilla blooms and lush greenery. 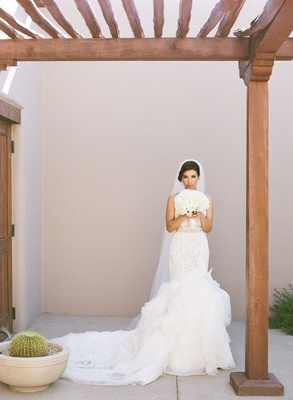 The bride, an entertainment journalist, was a vision in a striking mermaid gown with a lace bodice and organza skirt. Her brunette locks were gathered into a low bun and adorned with a glittering hairpiece, all of which laid nicely beneath a flowing veil. 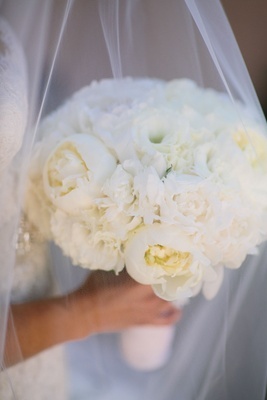 In her hands she carried a bouquet abundant with alabaster peonies. 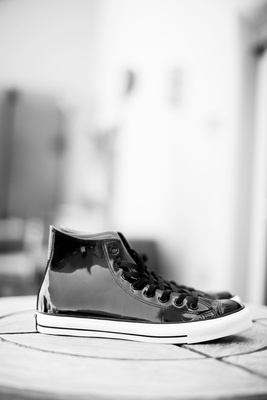 The groom wore a traditional black tuxedo while sporting a playful pair of patent leather tennis shoes. 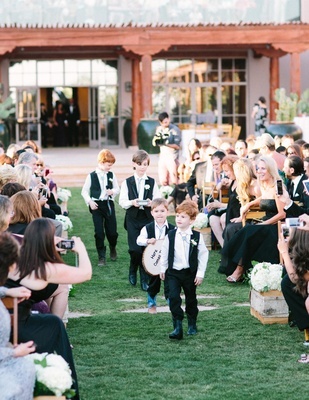 Bridesmaids were requested to wear long ebony gowns of their choosing, and four handsome ring bearers donned cowboy boots, vests, and bolo ties. Performing the traditional rituals of a Jewish wedding provided some of the most memorable moments of the day for both bride and groom, from the ketubah signing that took place with close friends and family prior to the ceremony, to the bride encircling the groom seven times during the service. 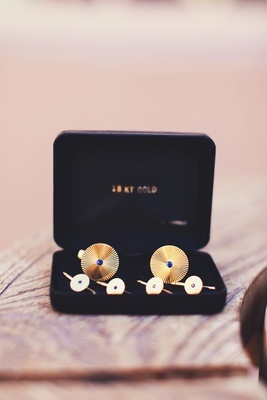 “It ended up giving me some much-needed time to dry up my tears,” the bride confesses. 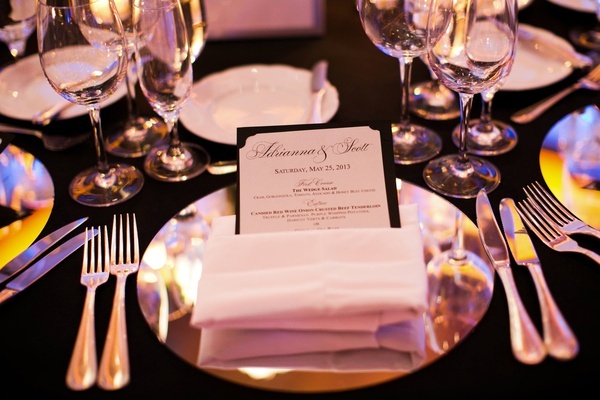 When it came time to break the glass, the groom leaped onto the goblet with his whole being. 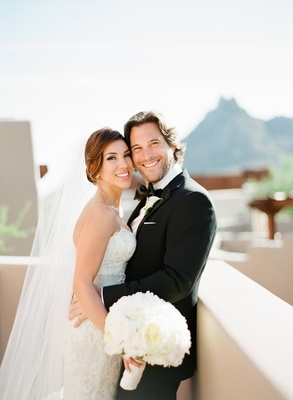 “I started my marriage off by jumping in two feet first!” he explains of the heartfelt moment. 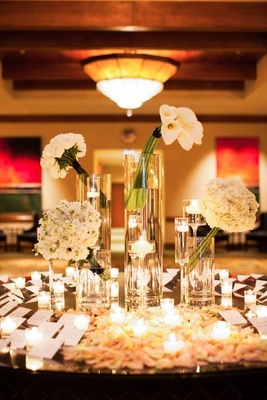 The lavish reception was held inside one of the resort’s elegant ballrooms. 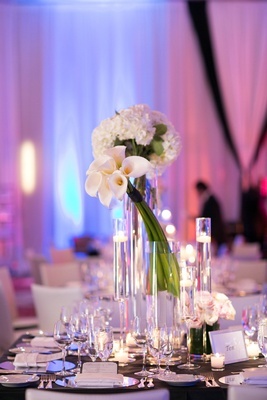 Sheer drapery cascaded from the walls, infusing the room with a chic, elegant ambience. 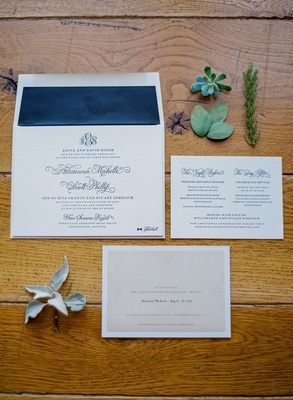 Creamy chairs contrasted with crisp, black linens on dinner tables to dramatic effect. 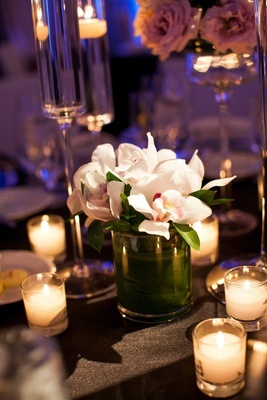 Centerpieces consisted of bunches of florals grouped by variety – hydrangeas, roses, peonies, and calla lilies – resting in clear, glass vases of differing sizes and heights. 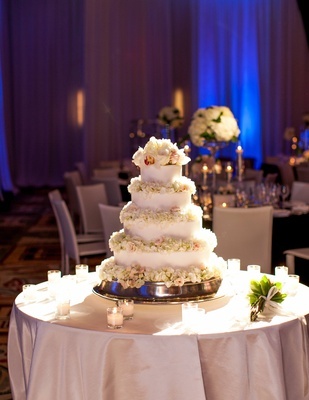 Coordinating blooms decorated each tier of the couple’s exquisite wedding cake as well. 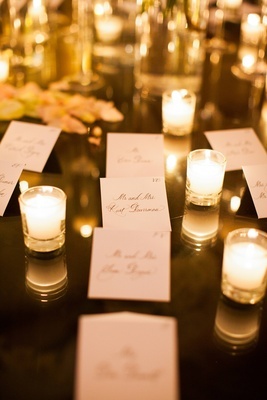 From the start, the groom knew exactly which aspects of the reception had to be impeccable. “We wanted to choose the best band we could find and we wanted to have wonderful food,” he explains. 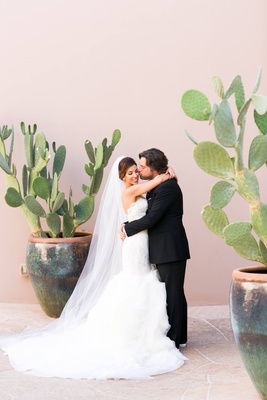 The dinner menu featured Southwestern-inspired delicacies including “the most incredible cheese and mushroom risotto-stuffed chile rellenos you have ever tasted,” he says. Although the couple had taken lessons prior to their first dance, Scott inadvertently forgot his steps in the heat of the moment. “It didn’t matter,” laughs the forgiving bride. “It was so romantic and the band nailed our song.” She even requested they play the tune again as the last number of the night. “It was like our own private concert,” she smiles. Other than that note, both bride and groom say they wouldn't change a thing about their fabulous affair. 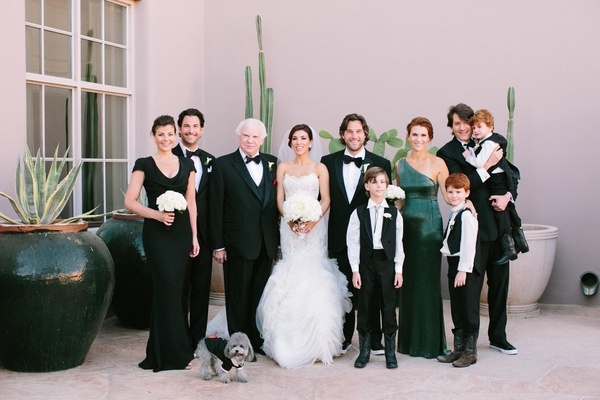 "This was truly a wonderful wedding," exclaims the groom.